In a food processor, add the garlic and pulse until chopped. Add all the remaining ingredients and process until smooth. If still too thick, add more water until you reach desired consistency. Taste. Add more red pepper flakes if you want it spicier. We’re loving this fabulously healthy dip. It’s loaded with such good-for-you ingredients. Unlike most hummus, which is made mostly of garbanzo beans, tahini, garlic and olive oil, this ones unconventional. 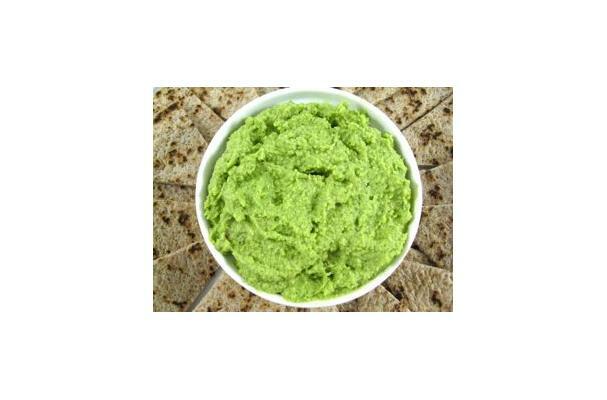 Our green colored hummus has garbanzo beans, garlic and hummus, but you’ll love the addition of edamame and fresh spinach. Talk about vitamin and antioxidant rich! Whipped up our skinny dip today...It will be a big hit and a keeper for sure.